Repalcing the worned ones on your skatebord scooter inline blade electric motors, wheels of bicycle & motorcycle,automobile, electric hand power tools, etc in many other rolling applications. Please do check dimensions/size or the precision grade if it fits in on your device. its straight bore fits conventional cylindrical shafts, and its nylon cage prevents the balls from coming into contact with each other during use, reducing friction, vibration, and noise. Removable single lip contact seals on both sides protect against contaminants and retain lubrication applied at manufacture. This ball bearing is suitable for use in skate boarding, inline skating, and other skating applications. Material:Carbon steel. These brand new bearings come directly from factory and fully tested. If you have any questions about this product by SINYUM, contact us by completing and submitting the form below. If you are looking for a specif part number, please include it with your message. 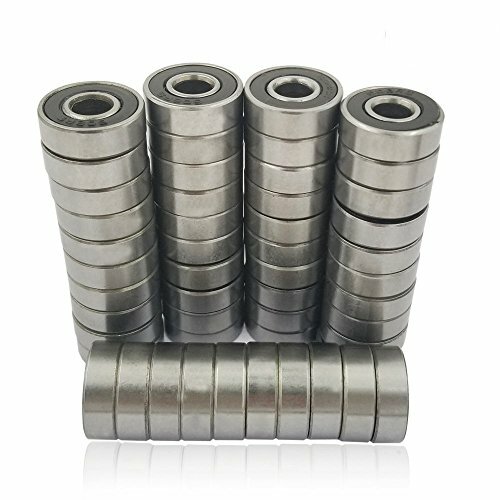 XiKe 10 Pack 6204-2RS Bearings 20x47x14mm, Stable Performance and Cost-Effective, Double Seal and Pre-Lubricated, Deep Groove Ball Bearings.